An interactive map of the campus and the surrounding facilities can be found here. 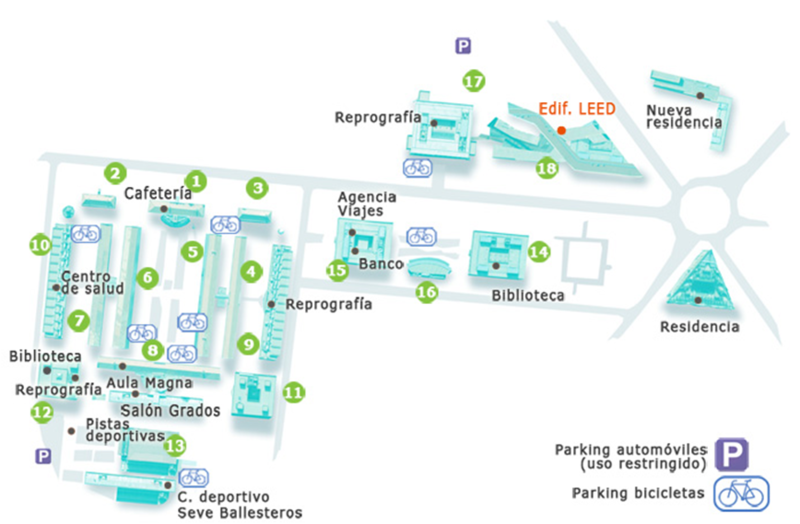 Access to the venue: use the gate in Calle Madrid, between buildings 1 and 2. Main conference: “Aula Magna” and “Salón de grados” (access through Building 8). Workshops: Building 6 (“Edificio Normante”). Luncheon will be served each conference day at the first floor of the cafeteria (Building 1). On site services: a Bank, an ATM, and a travel agency are located in Building 15. From terminal T4: take the "Cercanias" train (line C1). Change to line C4 in Chamartin (or in Atocha), taking the train to Parla (line C4), and get off at the stop Las Margaritas/ Universidad. Upon leaving the train station from the main exit, turn right and walk straight on for 5 minutes or so until you reach the University campus (total time: 60-70 minutes). From terminals T1, T2, or T3: you can use the free bus, which connects to terminal T4, and take the Cercanias train, as described above (total time: 80-90 minutes). 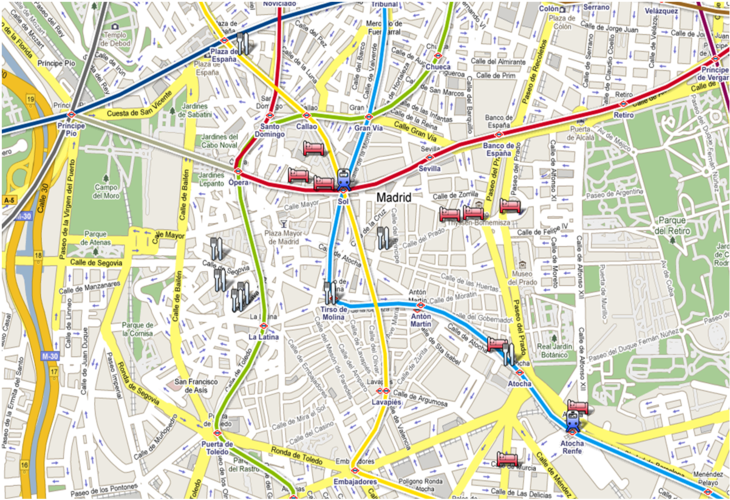 In alternative, you can walk to the metro station in terminal T2, and take Metro line 8 to Nuevos Ministerios. In the Nuevos Ministerios station you can then change to the Cercanias train heading to Parla (line C4). Get off at the stop Las Margaritas/ Universidad. Upon leaving the train station from the main exit, turn right and walk straight ahead for 5 minutes or so until you reach the University campus (total time: 70-80 minutes). Take the "Cercanias" train to Parla (line C4) in Atocha, Sol, Chamartinor Nuevos Ministerio station and get off at the stop Las Margaritas/ Universidad. Upon leaving the train station from the main exit, turn right and walk straight on for 5 minutes or so until you reach the University campus(total time: from 30 minutes—taking the train in Atocha—to 45 minutes—taking the train in Chamartin). There is a metro station nearby the campus (Juan de la Cierva Station), which you might consider to travel to/from other towns (e.g., Alcorcon and Leganes) located in the southern metropolitan area of Madrid. If you travel by car, we recommend using a GPS with the address or the coordinates given above. There are many highways passing nearby the campus, one of them is highway A42 (Madrid-Toledo), which you can take from the center of Madrid.E.g., from Plaza Imperador Carlos V (Atocha station), follow the signs to A42, direction Toledo, and drive straight until exit 10, then exit and follow the purple signs to UC3M. After 2 minutes you will get to Calle Madrid in Getafe, with the conference venue on your left hand, soon after the first traffic light in that road. To park, you can use the free UC3M parking located in Calle Maestro Pablo Guzman: just turn right before the traffic light (see google maps link). The organization has arranged a limited number of pre-reserved rooms in selected Hotels in Madrid and Getafe. Please notice that there is only a limited number of pre-reserved rooms, and that the requests will be considered in a strict first come, first served basis. Found in one of the oldest areas of Madrid, Korgui calls itself a "Gastronomical Bar" where you can have a sit down meal, or simply enjoy some tapas at the bar. The menu combines traditional Mediterranean dishes with Japanese and Mexican influences. Later on things liven up with music and the restaurant takes on a more nocturnal "fiesta" ambient. An elegant restaurant, based in the "Little Paris" area of Madrid, near the famous Plaza de Cibeles. El Fronton aims to create a serene atmosphere in which to dine. Chef, Javier Garcia, prides himself on using top quality, seasonal ingredients.